LONDON, England (CNN) -- It is not often that football players are actively encouraged to play dirty -- unless of course they are taking part in a unique variant of the game called "Swamp Soccer" when it is virtually unavoidable. Originating from the bogs of Finland, the game was started by cross-country skiers who used the football matches in knee-deep mud to strengthen their leg muscles. The first tournament took place in 1997 with 13 teams, but now annual events take place in Sweden, Iceland, Russia and Brazil which can often feature over 200 teams. What do you think of Swamp Soccer? Do you prefer Beach Football of another form of the game? Let us know your thoughts on the 'Sound off' box below. Glasgow Rangers fan Stewart Miller imported the concept to the United Kingdom after a chance meeting with founder Jyrki Vaananen while on a business trip to Iceland. Miller launched the first UK tournament in 2005 and now teams travel from all over the globe to the Scottish village of Strachur to try and become the annual Swamp Soccer World Champions. Watch the action from the bog ». "We had teams coming from as far afield as Australia and New Zealand to take part in the tournament this year so there is an international flavor to the event," Miller told CNN. "There is a huge appetite to try out new things and I think that's why Swamp Soccer is able to capture the imagination of people. "The basic rules of football also apply to Swamp Soccer with the exception that matches are played in thick mud with six players on an oversized five-a-side pitch. "It's probably one of the only sports in the world where the worse the conditions are the better the sporting spectacle!" There is no offside in Swamp Soccer while kick-offs, throw-ins, corner kicks, free kicks and penalties are taken by using the hands to drop the ball onto a chosen foot. Teams are also allowed to make unlimited substitutions although no shoe changing is allowed for the match duration. Miller believes that the oft-used quote that the state of a pitch can bridge the gap between two unevenly match teams is even more applicable with Swamp Soccer. "You could put the Brazilian national side up against an amateur team and you wouldn't know who would come out on top -- the pitch really does prove to be a leveler in this instance," he said. "Although professional footballers are precious commodities these days -- I'm not sure we'll see any stars getting caked in mud too soon, most of them are far to pampered for that. "Nobody's ever been injured seriously playing in the swamp, sometimes somebody's got a cut or two but nothing big -- so maybe when they retire from the game they might be prepared to give it a go." The imaginatively titled Real Mudrid, Mudchesthair United and Cowdungbeath were unable to make it past the group stages in the 44-team event which was won by FC Full Gunge from Poole in England who retained their title with a 1-0 victory over The Chocolate Men. 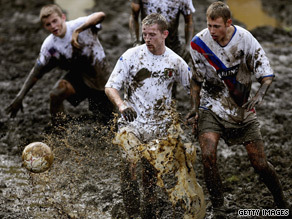 This year's Swamp Soccer tournament was held in a village in the Scottish countryside but Miller revealed that he intends to bring the mud game to metropolitan areas. He added: "The future for Swamp Soccer is in the city and of course I'm certain we'll bring all the mud with us. It will certainly make a great spectacle if set up a swamp in the middle of Glasgow or Edinburgh, so watch this space." If you are interested in taking part in the 2010 Swamp Soccer World Championships visit the official Web site of the tournament.